Growing up in the South Shore, Kenny was big into sports, which later introduced him to weight lifting. 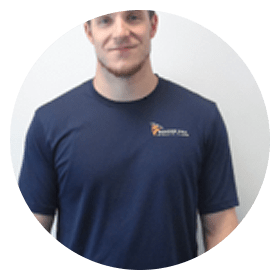 Through weight lifting, process of setting goals and staying motivated to accomplish those goals taught him that a strong mind is just as important as a strong body. As a student at Keene State College one of Kenny’s favorite areas of study was psychology and motivation. The understanding of what drives a person to want to achieve a goal and seeing someone consistently stay driven even when obstacles arise made weight lifting more than just a form of exercise. Kenny’s focus is getting his clients in the habit of pushing themselves and overcoming obstacles. This is essential in developing a strong mind, and will lead to success in fat loss, increasing general fitness, and strength and size development. One of the greatest keys is that these same confidence learned in the gym can be implemented in all areas of your life.